I was originally a DJ, and I really didn’t like the idea of playing live because I was very happy playing different genres and changing the mood when I wanted. Around 2008 my agent suggested I try playing live because it was a bit easier for me to get gigs that way. I was not very optimistic about it, to be honest. In the very beginning I just had a laptop and maybe one device with a couple of buttons and sliders. At that point my set was very pre-arranged, which didn’t feel right. So I decided to apply a lot of work to make something closer to what a DJ does: being able to change the mood at any moment. I decided to come up with certain concepts and stick with them for a long time. I wanted to have a system that allowed me to perform using muscle memory instead of thinking about which button to press and which knob to turn. For the past eight years my live set has been strongly based on a couple of Novation Launchpad controllers. They allow me to navigate through my set and launch either pre-recorded loops or to record and modify keyboards and drums on the fly without dealing so much with the computer. My weapons on stage change from time to time, but the philosophy is always the same. I wanted to be like a beat-box loop pedal guy, and I wanted to be as powerful as a DJ in terms of sound and diversity. For my main KiNK live set, I’ve stuck to more or less the same system. But on my technical rider there’s always one box with a question mark for a device I change every couple of months. It keeps me fresh even if I’m tired from being on the road, and it takes me out of my comfort zone. Most of my system is based on digital elements, so normally that extra equipment spot will be for something analog. For a long time I used a special synthesizer called the Leploop. It’s extremely unpredictable, but it makes something amazing that the computer cannot produce. I also use other small, mostly analog devices like the new Pioneer and Dave Smith AS-1 analog synth or the Korg Volca FM—anything that’s within that size range, but always a machine with character. I don’t bring them just because they’ll look good on stage. The way I see it, there shouldn’t be a formula to playing live. The KiNK show is something stable that changes slowly with time. Once in a while I get bored, so I do projects like my new techno project Cyrillic. The idea behind it was that I wanted to play live with standard DJ equipment. I use three CDJs to play loops of very basic recordings from my modular synthesizer: just basslines and simple melodies. The beats come from the Roland TR-8 drum machine. Everything is synced by ear, so it’s a bit demanding in terms of performance. When I have a free weekend, I try out different ideas in a little bar in my hometown, Sofia. Often I go there with some gadgets or DJ gear and try different combinations. I think it’s very important to try new gear and new systems in a live situation because it’s so different to practicing at home. It’s dark, you have drunk people around you, the sound is totally different and you don’t have much time to think over ideas. When I started to work on my whole live set concept, I wanted to focus on developing a system that would let me improvise and change it up every time instead of preparing everything beforehand. Most of my energy goes into figuring out different ways to sequence live in order to improve the way I loop MIDI and audio on the fly and trying to route my effects better so I have more impact with fewer buttons and knobs. Because my system is really open, I can either play full tracks I’ve produced or jam with one little half-bar loop I’m working on. I test these ideas way before they become tracks, which is great but also presents another problem. I just finished a new album I’m supposed to tour next year, but in a way I’ve been touring it all year—working on it in the studio, on the plane and in front of people as well. But generally it’s positive to have such an open system, as your crowds can witness the development of your music step by step. Of course, the final album will sound totally different to what people heard in the clubs. I used to have two options to start off my live sets. One would be a bit more disco-y, melodic and deeper, and the other would be more techno. I always had the first five to 10 minutes planned so I could double check my cables and controllers while the music was already going. Now I feel more secure with my system. I would find it very limiting to stick to that approach, so I actually don’t do that anymore. Instead I try to arrive one hour before my set time. I want to listen to the DJ or the live act before me, and I think it’s very important for me to build a good bridge between the previous artist and the artist after me—or to destroy that bridge, depending on the situation! Because of that, I can’t have anything prepared in the beginning. Sometimes I open for Jeff Mills; sometimes I play before Dixon. I like to go deeper and softer at the end, because I think it’s nice to leave room for the next artist to start properly. It’s nice to be respectful to the people after you. I need someone to tell me I have 10 minutes before the end of the set, and then I can prepare the stage for the next artist. It’s very important for me to remember that we all take care of the night together. It’s not just me or the headliner, and in that way I try to be less of a band and a bit more of a DJ. Tim Exile is the main reason I believe live electronic music can be interesting. 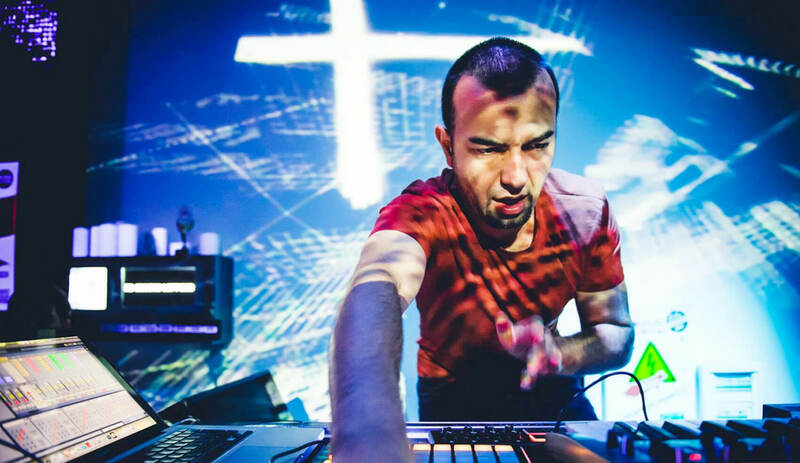 He uses completely computer-based systems and his own software platform with a lot of MIDI controllers, and what he does is completely improvised. I watched a really impressive show that he did, in which he made music only with content that people uploaded in real time on the web, so he didn’t know what kind of sound would come. He’s my biggest inspiration, and I’m still very far from his skill level. I also really like Mr. G, which is totally the other extreme. He doesn’t have any technical gimmicks; his system is extremely simple. It’s just a sampler and a mixer. But he is very serious about sound and the way he manipulates the sound directly from the mixer. It sounds very dope. To anyone thinking of making their own live set, the first thing is to keep it simple. You have to find a really good way to translate your music to the audience. You can be amazing at improvisation or you can have a very pre-recorded set, but you must have a kind of performance to it. A lack of performance could also be a performance, but you should have some sort of statement involved in your way of showing your music. There’s no definition, which is pretty cool. It could be the way you perform; it could be the way you look. It doesn’t matter. But you have to have a statement, and whatever you do, you have to keep it simple. The pressure on stage is very different than the lack of pressure at home.